Aller-Lung Support is intended to help support and maintain healthy lungs and sinuses. Many substances in the air such as pollens, tobacco smoke, fires, and environmental pollutants can negatively affect lung and sinus health . 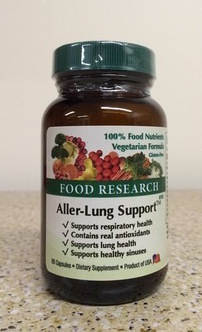 Unlike many so-called “natural” formulas, Aller-Lung Support is only comprised of foods, contains no synthetic USP nutrients or isolated mineral salts, but only contains foods, food complexes, and food concentrates. Studies indicate that food nutrients ARE better than isolated USP nutrients and MAY BE better absorbed retained, and utilized than USP nutrients. Acerola Cherry is one of the most vitamin C dense Foods . Not only does vitamin C have free radical scavenging abilities, it also has been shown to increase the antioxidant abilities of some other foods . 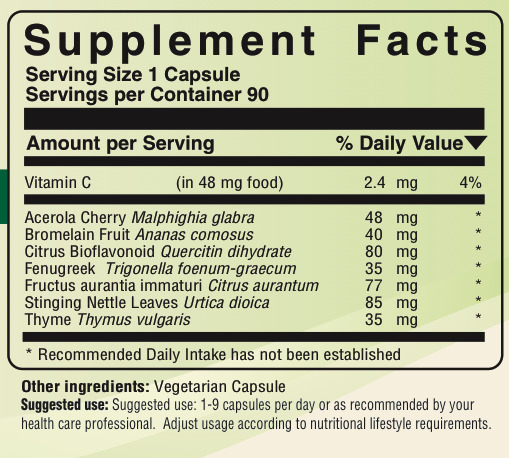 “Acerola…contains bioflavonoids” , anthocynins, and quercitin . One study concluded that vitamin C “supplementation provides a protective effect against exercise-induced airway narrowing in” some . Bioflavonoids, such as Quercitin dihydrate have long been used for sinus and lung health. Even the PDR admits, “Quercetin is one of several flavonoids that have effects on mast cells and basophils” . “The major active biological constituents in Citrus herbs are flavonoids, especially hesperidin, naringin and alkaloids, mainly synephrine, with beneficial...effects on human health” . Quercetin is often advised for lung health . Bioflavonoids are also sometimes simply called flavonoids. Citrus bioflavonoids have been found to help maintain lung health . Bromelain fruit Ananas comosus is a widely used pineapple extract. It has sometimes been advised for maintaining lung health [9-10]. Fenugreek Trigonella foenum-graecum has been used for “upper respiratory catarrah” . It is “often used for breathing” . It is a common ingredient in curries. It has been advised for lung health . “Fenugreek has been shown to soften and dissolve hardened masses of accumulated mucous…It loosens and expels mucus and phlegm accumulated in the bronchial tubes ” . Stinging Nettle Urtica dioica has been used to support healthy lungs and sinuses [7,12]. Thyme Thymus vulgaris has been approved for use by the European Commission E .
Note: People with allergies can be allergic to many things, including herbs. Also, if one has some type of Staphylococci infection, it is normally best to avoid bovine (cow) dairy and sometimes oat-containing products. The 100% Food Aller-Lung Support formula contains herbs that can help maintain the health of the lungs and sinuses.